Shooting Fish was the first screen movie to ever feature a Divine Comedy song in its soundtrack. The featured song is ‘In Pursuit Of Happiness’ from A Short Album About Love, an idea which would be used for other movies again. 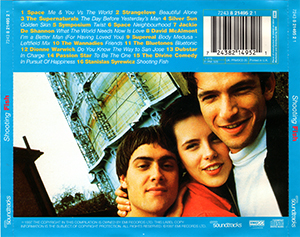 The soundtracks was released at a CD, it features other artists such as Space, Strangelove, The Supernaturals, The Wannadies or The Bluetones.